Manshin: Ten Thousand Spirits (만신) had the distinction of being the opening film for the 2013 DMZ Documentary Film Festival, and deservedly so. Director Park Chan-kyong’s (박찬경) film not only provides an autobiographical account of renowned shaman – and intangible cultural asset – Kim Keum-hwa, but also explores her life and times in conjunction with an incredibly tumultuous period of (recent) Korean history. 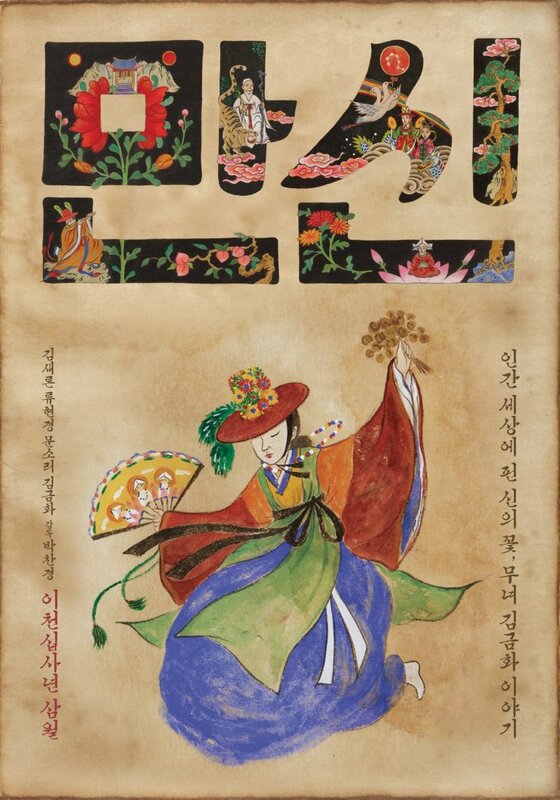 The result is a fascinating look at key components of Korean history and culture through the endurance of Kim Keum-hwa and her dedication to traditional shamanism. By delving into her past and reenacting key moments, issues ranging from the evolving state of feminism, the relationship between North and South Koreas, and the Park Chung-hee era all combine into a portrait of a woman and a country who have held on to tradition despite the odds. Director Park Chan-kyong has previously expressed his interest in shamanism through his excellent short film Night Fishing, yet with Manshin he examines the cultural form in a much more profound fashion. One of the great strengths of the film lies in not only exploring but reenacting Kim Keum-hwa’s life. Talented actresses Kim Sae-ron, Ryoo Hyeon-kyeong and Moon So-ri all depict the shaman at different stages of her development and portray the various trials she was forced to endure with sincerity and depth. These scenes, combined with Kim Keum-hwa’s interviews and quotes from her published work, make the autobiography a palpable and moving account of a woman who has endured much throughout her life. Her marriage at 14 years old in North Korea is a harrowing story of violence and fear, while her embrace of shamanism and emigration to the south years later is one of hope and sorrow; the persecution Kim experienced in her middle-ages despite her dedication to Korean culture adds even further tragedy. Each stage of Kim Keum-hwa’s life would be enough for a novel or film in itself, yet her perseverance through so many challenging events is constantly admirable, while the poignant performances of the three lead actresses, in conjunction with Kim’s interviews via voice-over, add incredible weight to the story. Brilliantly, in depicting Kim Keum-hwa’s life Manshin also reveals Korea’s astonishing recent history. Director Park seamlessly aligns Kim’s efforts to remain alive and strong with that of the country and culture itself, as the shaman attempts to avoid the Japanese occupation in North Korea, her departure to the south following the outbreak of civil war, and dictator Park Chung-hee’s desire to erase anything considered old or antiquated in his quest to modernise the country. Director Park emphasises Kim’s struggles as national ones, trials dedicated to the preservation of cultural materials and practices despite the odds. As such the film never takes a stance on whether shamanism is real or otherwise, instead focusing on cultural value and national identity, as well as Kim’s empowering status as an intangible cultural asset. Manshin is also a very attractive documentary. Director Park Chan-kyong certainly has a keen eye for composition, with shots throughout the reenactments of the shaman’s life often akin to paintings. Furthermore symbolism is also skillfully woven within such scenes, from the connotations of finding a shoe through to the appearance of the gods themselves, that add an understated beauty and mysticism. The use of light and colour are consistently appealing and capture the vibrancy of Korean shamanism with confidence, as well as conveying the different stages of Kim’s life, her emotions, and her otherworldly abilities. The animated sequences, which serve to explain philosophies behind shamanism, are exquisite and beautifully convey the uniqueness of Korean culture, and are a genuine delight whenever they appear. However, Manshin is an extremely ambitious documentary, so much so that the overall film suffers for it. In attempting to contain so much about Kim Keum-hwa’s life, shamanism and Korean history, the film becomes a somewhat superficial exploration, exploring key moments yet tending to gloss over further details as well as occurrences in the intervals between. Manshin often loses focus due to this, and the structure of the film generally is rather loose requiring audiences to ‘stick with it’ for certain periods before getting back on track. Despite such criticisms, Manshin is a very rewarding documentary, and one that serves to enlighten and entertain in a myriad of ways. Manshin: Ten Thousand Spirits (만신) is a very enlightening documentary about Kim Keum-hwa, Korea’s premiere shaman. Director Park Chan-kyong beautifully captures, and reenacts with three of the country’s top actresses, the key events of her life from Kim’s youth in North Korea through to her contemporary life in the south. 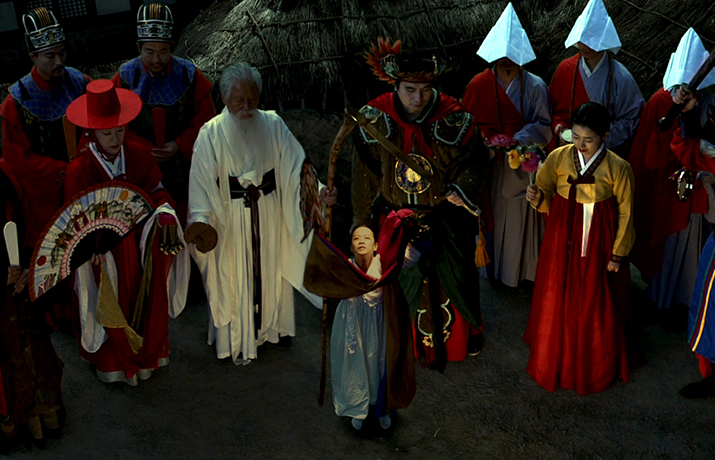 Masterfully, director Park also depicts Kim’s life as a shaman in conjunction with the development of Korea itself and the preservation of cultural identity. While the structure is uneven and the story tends to lose focus, Manshin is a rewarding and illuminating experience. Interesting! I can’t wait to see this. Thanks Jeffrey, glad you enjoyed reading. will be released in Korea in March I believe, although no word as of yet about English subtitles or international territories…hopefully it will appear in the near future.